I’m a fourth generation rapeseed farmer on a mission. 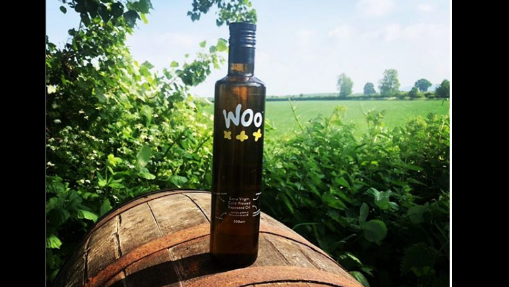 I want to stop people buying poor quality olive oil that has been intensively farmed by massive faceless corporations, shipped halfway round the world, tastes bland and actually isn’t very good for you Woo is made up of Sam, a fourth-generation rapeseed farmer and Matt, his brother-in-law who runs a successful online beer business. Sam convinced Matt that flogging oil was a good idea after he read that cows love eating the byproduct of rapeseed oil production. Yup, this business was started because Sam wanted some tasty grub for his cows. The rapeseed for our oil is grown right here on our family farm in Worcestershire. The only water we use comes straight from the clouds above. Thankfully, there is always plenty of that round these parts. All the waste from rapeseed production goes to our cows to eat. They love the stuff.